Vanee Chunky Corned Beef is made from tender, fully trimmed beef cured in corning spices. Perfect for signature corned beef hash, or any corned beef applications. 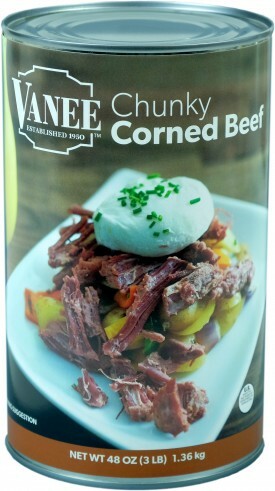 Vanee Chunky Corned Beef frees up valuable freezer space by being shelf-stable, has lower sodium than comparable options, is a fully usable product, and it saves you the time and labor of having to trim and corn a beef yourself. Each 48 oz. can contains around 27 quarter-cup servings, for a total of 162 servings per case. Use to make signature corned beef hash, or for any other corned beef applications. Drain and reserve broth. Empty contents into bowl. Use according to your recipe. Add back broth as needed. Convection: Place covered prepared product into 300°F oven for 30–40 minutes until center reaches 165°F. Conventional: Place covered prepared product into 350°F oven for 60 minutes until center reaches 165°F. Microwave: Place prepared product into microwave safe covered container. Heat on high approximately 2–3 minutes per portion or until center reaches 165°F. Stove Top: Place uncovered prepared product over medium heat for 10–15 minutes or until center reaches 165°F, stirring occasionally to prevent scorching. Corned Beef (Beef Cured with Water, Salt, Sugar, Sodium Phosphates, Sodium Nitrite).